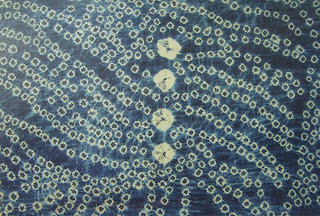 Mrpotani visited the Textile Museum while in Washington, D.C. and sent this card from the current 'blue' show. Mrs. October, meanwhile, has gone back to baseball with this most recent card. Another card from the road. 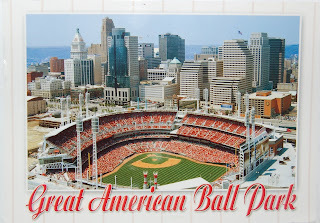 Mrpotani picked up this ad card with its skewed graphics at the Cincinnati ballpark. This wonderful Moomin card came from a 17-year-old Finnish postcrosser named Leevi, who turns out to be a friend of Hanna's (see July 7). Leevi was on his way to an opera festival, then to go hiking with Hanna and her family. It all sounded just lovely. 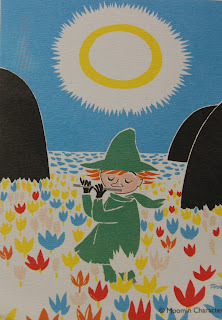 The Moomin card above came with this fitting Moomin stamp. Much appreciated! 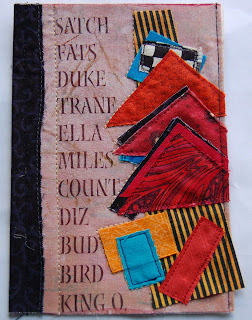 This super fabric postcard arrived out of the blue from fiber artist Lauren Camp, who used her signature stitches and colors to create this riff on some jazz greats. If you don't know Lauren Camp's fab jazz series, check it out pronto at www.laurencamp.com. She also hosts a weekly jazz show on a public radio station in Santa Fe, writes about jazz, and does her part to keep the music going. Thanks so much, Lauren! 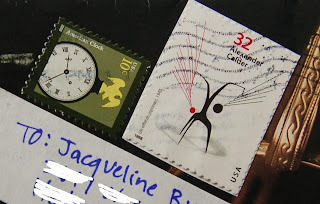 Even the postmark became part of the design on the envelope Lauren Camp made to send her fabric card. Dig the name of the Calder piece. 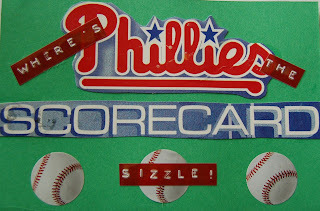 A card for Mrs. October, who is undoubtedly fretting over her team. I made it with recycled parts and stickers and tags. 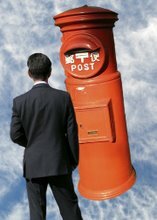 Wednesday, while taking care of some business at the UN, Mrpotani came across the United Nations post office. Who knew the UN had a p.o. with its own stamps and everything? Great find. I've got to check it out. 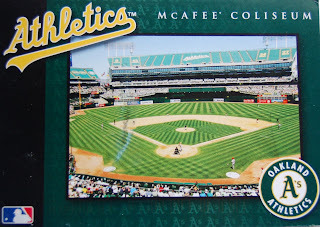 The A's always have interesting promotions and goods, and McAfee Coliseum sells Guinness on tap. What's not to like? 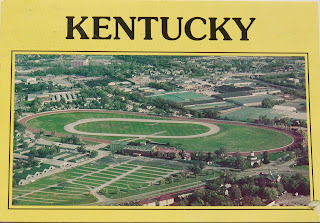 This card was part of a set sold at the stadium. Each card comes with a specially-ordered stamp that bears the exact image on the card. Mrpotani sent this in May. Pitchers, a local sports bar and grille, was handing out these postcard-sized gift cards the other day at Coca-Cola Park. I plan to use this one as a postcard. It shows the park. 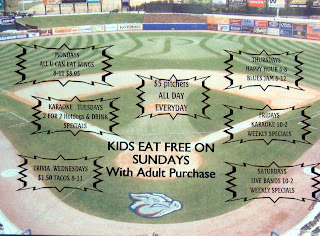 Would be nice if the IronPigs sold postcards of the park! Another stop along Mrpotani's roadtrip, this time from the Red Mile, an historic harness racing track in Lexington, KY.
Two technologies side-by-side in these Romanian stamps. 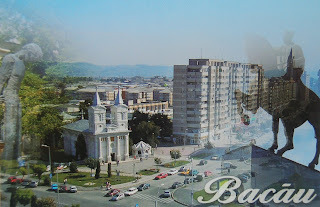 A Romanian postcrosser named Leonard sent this card from Bacau. The city, he writes, is the birthplace of George Bacovia (shown on the left), one of five national poets of Romania. He adds that Nadia Comaneci and Bela Karoly, the women's gymnast trainer, were both born in his native Onesti, not far from Bacau. Many thanks, Leonard. A baseball card from Mrpotani, who is on a road trip in the Northeast. This is the ballpark in Cincinnati. This striking card is again from Jessie F. It's almost becoming a card-a-day from her. She seems to like making them as much as I like getting them. 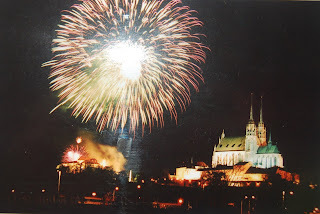 An American expat in Brno sent this postcrossing card showing fireworks over the city's famed cathedral of St. Peter and Paul. A perfect summer postcard. No sooner do I think of Jessie F. (aka Mrs. October) than another card arrives from her. 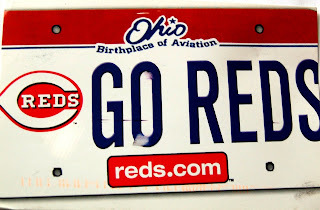 Time to send a baseball card to Mrs. October. Chase Utley is her favorite current Phillie. He's sure to hear it from the boobirds this upcoming series in NY. 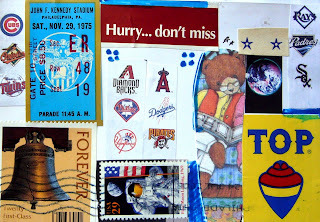 The Kaj Stenvall card (below) bore this free-spirited stamp, urging me to embrace the season. I'll think about it when the heat and humidity go down. 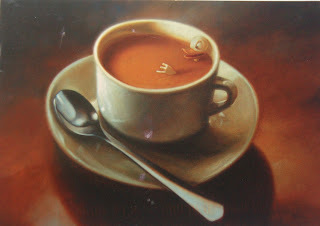 This card from a Finnish postcrosser shows a disquieting image titled A Big Coffee. It's by the popular Finnish artist Kaj Stenvall. Something more than whimsy is in play here. 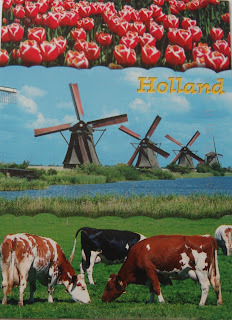 A Dutch postcrosser sent this card featuring a trio of typical images from Holland. It works! I count myself lucky to be on Jurgen Lehl's mailing list. The German-born designer, whose headquarters are in Tokyo, always sends a long scroll to announce his newest lines. Shown are two panels from the latest, which came last week. Once the season wanes, I usually end up using the paper for stationery. Summer is Maine. 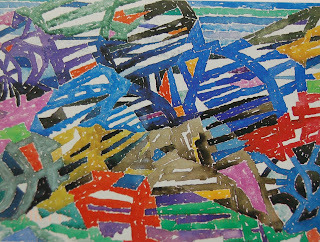 Called Lobster Traps lll, this fab watercolor and collage image by American artist Hans Moller brings the state to mind. A friend in Arkansas sent the timely card. 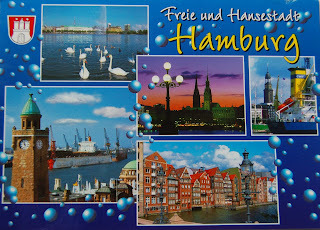 A German postcrosser named Evelyn sent these bubbly views of Hamburg. She writes that she loves living in the city. 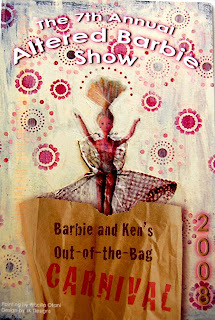 Mrpotani sent this card which shows her entry in the 7th Annual Altered Barbie Show at the Art94124 Gallery in San Francisco early this August. 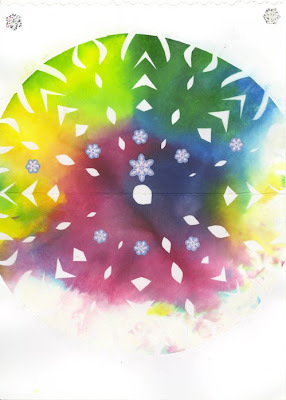 Another cool card in the holiday vein from Jessie F. She incorporated a real ribbon into this one. 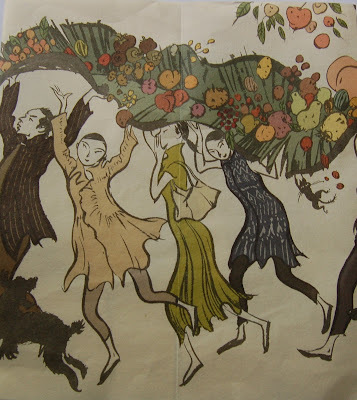 Am I really a Bodhisattva or a hungry ghost? This is the final card from Lee Kihyang's Moving Image series. 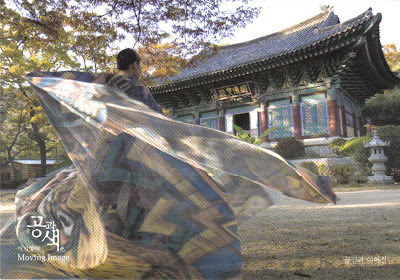 For more about this artist, go to www.art-to-wear.pe.kr. 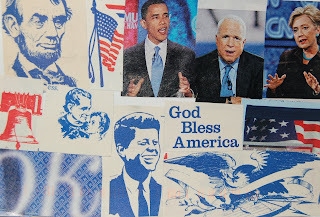 These very cool stamps were affixed to the card below. 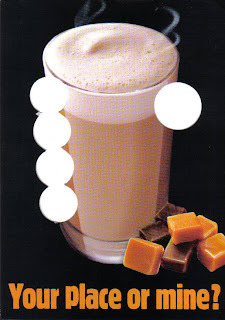 A coffee-loving Dutch postcrosser sent this clever card. The white circles are holes for your fingers. Even funnier, the woman's postcrossing profile specifies that she does not like free cards, though this is a free Boomerang ad card. 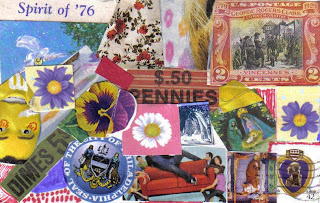 Another envelope from the calendar. This one shows Kotooshu, the tall, dishy Bulgarian ozeki, at a practice session at his stable. 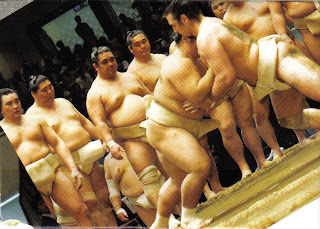 In May, Kotooshu won a grand championship, the first ever by a European sumo wrestler. If he can do it again at Nagoya, he'll make yokozuna. Go, Kotooshu! The guy is seriously yummy. 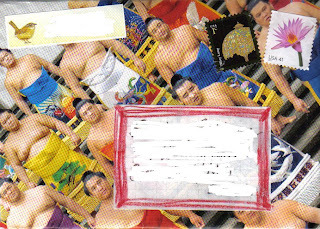 The Nagoya tournament starts today and I've been making envelopes from a big (what else) sumo calendar sent by a Tokyo friend. These pudgy fellows look like dolls. Two cards arrived together yesterday from Mrpotani, evidence of a busy weekend. 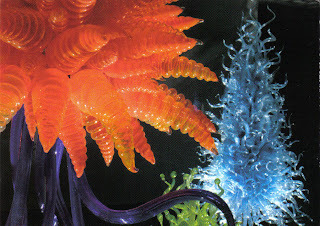 The bottom one is from the movie about Hunter Thompson and the top from the Dale Chihuly show now on at the deYoung. 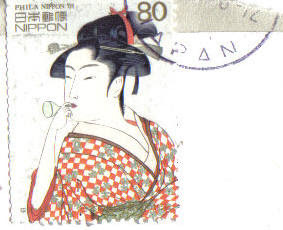 Another ukiyoe stamp, this time of a bijin, or beauty, from the floating world. 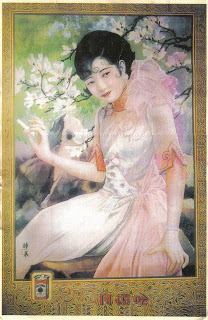 This retro card advertising cigarettes came from a Shanghai postcrosser. The woman in the ad looks like a sprite. That's quite a cigarette she's holding. Image 2 from Lee Kihyang's Moving Image series has to do with seeing and perception. Today the Dalai Lama starts a six-day teaching at Lehigh University, here in the Lehigh Valley. He will teach The Great Treatise on the Stages of the Path to Enlightenment. It's not everyday that I get a card from Zagreb. 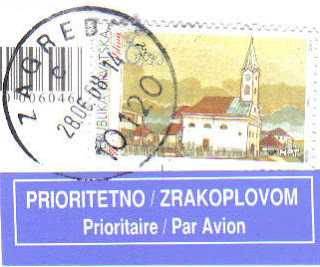 This was from a Croatian postcrosser. 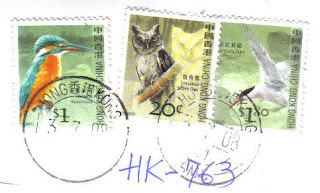 These three birds were on a card sent by a Hong Kong postcrosser. Artist friend Lee Kihyang was in the States last week from Seoul, but we were unable to connect in NY. Instead, she sent a beautiful little 'card catalog' from her March exhibition called Moving Image. 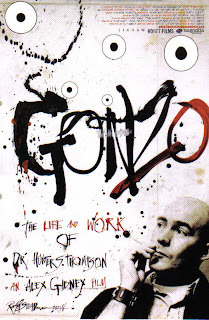 I've several times written about Lee and her Buddhist-inspired works. Based on the Heart of Wisdom Sutra, the recent multimedia show featured Lee's fabric and body painting. Please see www.art-to-wear.pe.kr. 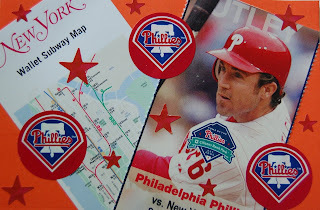 I picked up this ad card the other night at the IronPigs game in Allentown. 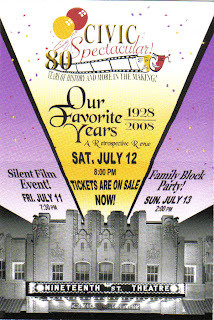 This weekend the 19th Street Theatre, my fave indie movie theatre, is hosting a variety of events to celebrate the 8oth year of its repertory Civic Theatre. On Friday night is a Buster Keaton film, with five-cent admission. 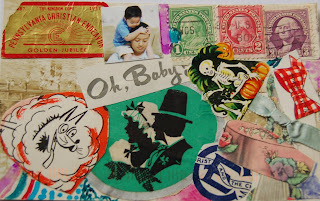 A recycled card from an Austrian postcrosser. 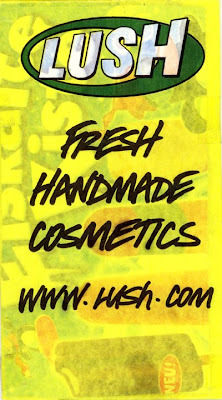 I love the images peeking through the bright yellow Lush wrapper! 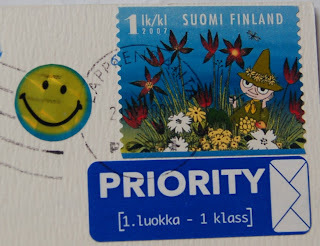 Wonderful bluebird stamp on a postcard from Finland. 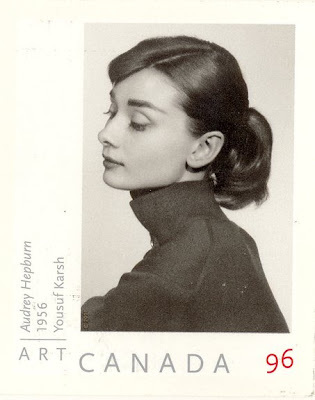 A Canadian postcrosser made this sweet snowflake card and enclosed it with a wonderful Audrey Hepburn stamp. Ponytails never looked so glam. Some of my favorite Japanese stamps are the ukiyoe ones. 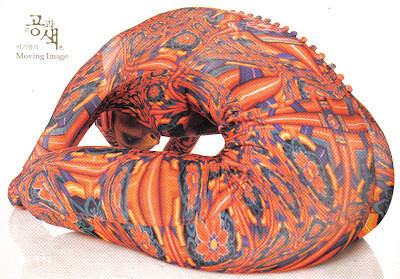 Tokyo-based German designer Jurgen Lehl must have a lifetime cache of them. He always uses them on his annual mailings. 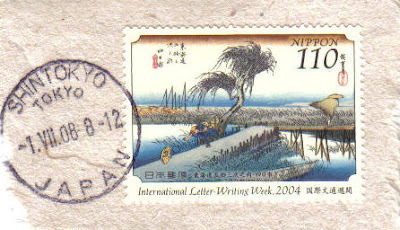 One came yesterday with this 2004 stamp featuring a print from Hiroshige's famed series of the old Tokaido post road. Jessie F. keeps the cards coming. 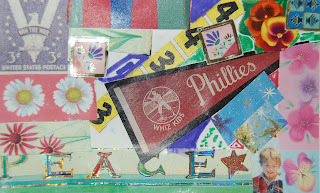 Spirit of '76: most appropriate for the native Philadelphian that she is.